Firefighters from Waterville reach the roof of the Huhtamaki mill for a fire that had several departments respond on Tuesday evening, Jan. 29, 2019. 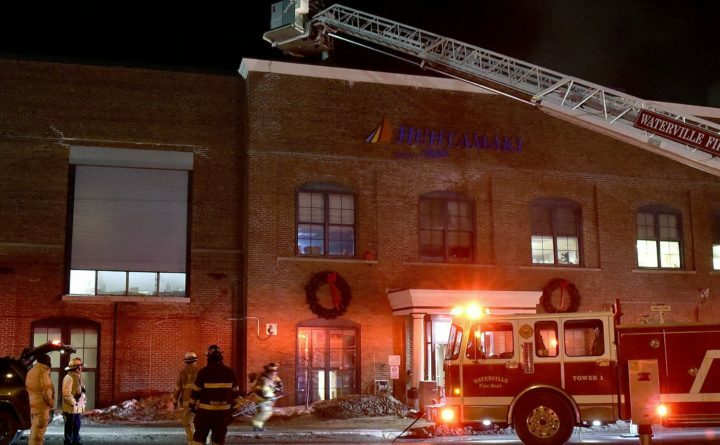 The Huhtamaki paper plate factory is expected to return to normal operations within four weeks following a four-alarm fire on Tuesday that caused at least $1 million in damage to the building, which spans Fairfield and Waterville. “Following inspections, employees are working to clean the areas affected by the fire on Jan. 29,” Wess Hudelson, spokesman for the factory’s parent company in De Soto, Kansas, said in a prepared statement. He also thanked local emergency crews for their response to the fire in sub-freezing temperatures. “Production in areas unaffected by the fire will resume on Jan. 31, and remaining areas affected by the fire should return to normal operations within four weeks,” he wrote. The fire, caused by a dryer malfunction, was ruled an accident by the state fire marshal’s office. Damage was estimated at more than $1 million. Hudelson said disruption to Huhtamaki customers will be minimal. “The finished goods storage is located well away from the area where the fire took place, and there is no damage to those products,” he said. Hudelson said the factory also stores products in external warehouses. “We believe we have enough inventory and redundancy in production from other locations that no significant service disruptions will take place,” he said. Huhtamaki, a Finland-based food and beverage package maker, has factories in Waterville and Lewiston. The Waterville factory makes compostable paper plates. Hudelson said the employees evacuated the factory in a timely manner and no one was injured. Fire doors functioned properly to contain the fire and limited damage.